This page contains a single entry from the blog posted on April 20, 2009 11:01 PM. April 12: Masonry demo in progress. 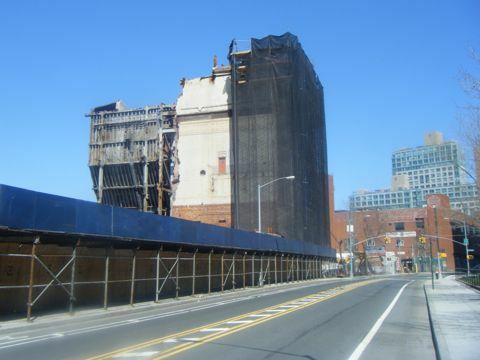 The demolition of the BRT Power Plant on Kent Avenue entered a slow-motion phase a while ago. In the last week or three, they have finally gotten to removing most of the masonry, revealing the coal pockets that were housed in the north portion of the building. Coal pockets? Indeed. These massive iron bins were used for storing coal to fire the boilers which in turn ran the turbines that provided the power to the BRT system. The coal would have been delivered by barge and hoisted up into the pockets, from whence it was fed by gravity to the boilers below. If this type of infrastructure turns you on, get on out to the site quick. Once Con Ed figures out how to take these things apart, they will probably disappear pretty quickly. 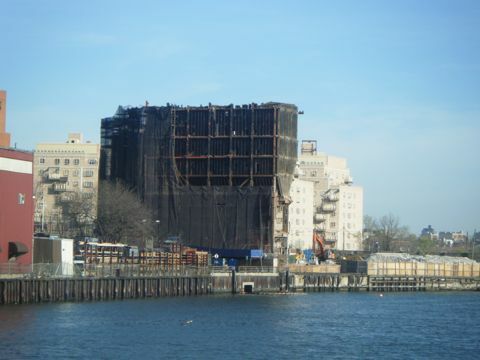 April 17: View from the Water Taxi at Schaefer Landing.